Daily Illuminator: Announcing The Dopple Spyke Figure! January 15, 2015: Announcing The Dopple Spyke Figure! Need someone to take the blame when you stab your buddy in the back? Look no further! 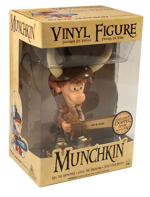 The new Munchkin Vinyl Figure from Funko will keep all the orcs at bay, will ruin miniatures gaming, and probably won't spontaneously combust! Huzzah! Unlike the original color Vinyl Figure and the glow-in-the-dark Vinyl Figure, the Dopple Spyke figure comes in the two-tone color scheme that the original printings of Munchkin were printed in, as a nod to the game's history. It'll also be available at your friendly local game store in May!